Garage Storage System Wisconsin: Reducing Clutter in Your GarageGarage Interiors, Inc.
With the New Year upon us, it’s time to create resolutions and work on ways to stick to them. When it comes to your home and your belongings, we see a lot of resolutions that surround the removal of clutter and improvement of organization. These resolutions are possible for your garage as well! Don’t let the interior of your home be the only part of your life that gets to enjoy the perks of organization and reduced clutter. Keep reading to see a few of the ways that you can reduce clutter in your garage this new year. Decluttering is something that feels good when it’s done, especially if it’s been done right. The mistake that most of us wind up making is that we never dedicate enough time to the process and leave ourselves with a bigger mess than we started with. Sure, it’s nice for the process to be done, but if you aren’t actually spending the time to decrease clutter, you might find yourself with more work to do. For that reason, we always suggest dedicating enough time to get the task done without being overwhelmed. Depending on the size of your garage, it could take anywhere from a day to a couple of weekends for you to finish decluttering. Just make sure that you give yourself enough time to declutter properly, and you’re off to a good start. If you’re reading this blog and you’re seeking a solution for decluttering, then you’re probably scared just reading that you need to go through every item. Our garages quickly turn into spaces where we store items and, over time, where we forget about things. That’s the exact reason that we suggest going through every item in your garage. When you spend time looking at every individual item, you can decide whether it’s something you keep, sell, donate, or throw out. The reality is that every single thing in your garage will fit into one of these categories and will also help you minimize the amount of clutter. A crucial part of organizing your space and reducing the build-up of clutter is ensuring that every item has a place to call home. This can be overwhelming at first because most of us have quite a bit that we store in our garages but, when you take time to declutter, you should be able to get a clear idea of the items that you’ll be storing in your garage and what needs to find a new home. At first, our garages are a place to store items related to our cars, tools, and any outdoor equipment that we use to stay on top of lawn care. After a while, you might find cleaning supplies, tubs full of winter clothes, and boxes of knick-knacks you forgot were out there in the first place. The goal is for you to go through these items so that you know what you need to keep and what you can part ways with. After you’ve done that, you can better determine which of these items belong in your garage and which would be better off in the basement or already have a home inside the house. This will help reduce the clutter in your garage and work on enhancing organization. Once you’ve determined which items you’re going to keep in your garage, you can move forward to the next step: incorporating storage. Now that you’ve minimized the amount of clutter in your home, it’s time to incorporate a storage system that allows you to make the most of the space that you have. 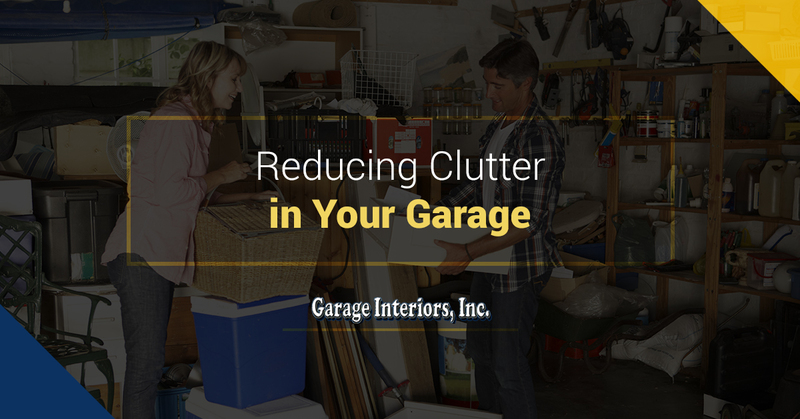 Garage Interiors, Inc. has a huge selection of garage storage systems that can help you keep clutter to a minimum while also finding a storage solution that works for you. Whether it’s a smaller storage unit or something that takes up your entire wall and offers endless possibilities, we’ve got you covered. While you may think that tubs and shelves are enough to make for an organized garage, there’s so much more that you can do to enhance your level of organization. Now that you have an idea of what you’re going to be storing in your garage, you can find a storage system that provides you with more than enough space to keep things out of the way and organized. Now that you’ve decluttered your garage, it’s time to find the right garage storage system. Our team offers a massive selection of storage systems designed for all garage shapes and sizes. If you’re interested in learning more about the garage storage system opportunities available to you, browse our selection of storage systems and find one that suits your needs. Reach out to our team if you have any questions or inquiries that we could assist you with.